Tens of thousands of South Sudanese have fled their homes and are now trapped under intense sun without food, water or medical care, aid agencies said after fierce fighting forced them to pull out of the region. Almost 40,000 thirsty people are camped out in temperatures of about 40 degrees centigrade in Aburoc village, near the border with Sudan, said Marcus Bachmann, South Sudan head of mission for the medical charity Médecins Sans Frontières (MSF). “The quantity of water is not enough to survive in this environment,” he told a news briefing via Skype from Juba. South Sudan descended into civil war in 2013 after President Salva Kiir fired his deputy, unleashing a conflict that has spawned armed factions which often follow ethnic lines. 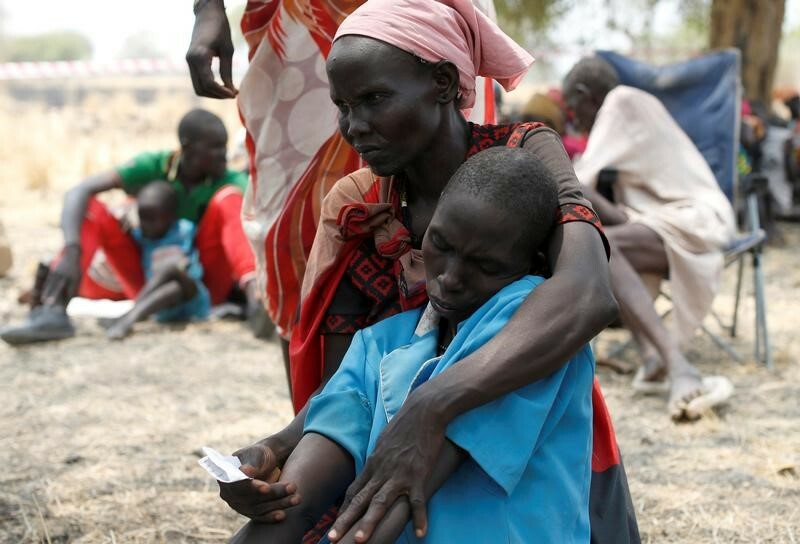 The United Nations has raised fears of a possible genocide as millions have fled their homes, the economy is in a tailspin, harvests are devastated by drought and millions of people face famine. A government offensive in two parts of Upper Nile State, near the border with Sudan, forced 32 humanitarian staff to be relocated on Monday to the capital, Juba, said the U.N. Office for the Coordination of Humanitarian Affairs. The displaced population in and around Aburoc is likely to hit 50,000 in the coming days, it said in a statement, and people are also reported to be crossing into Sudan for safety. “People fleeing… to Aburoc are undertaking long and treacherous journeys — some travelling eight days by foot without access to water and food,” it said. MSF’s Bachmann said water trucks could not reach Aburoc, and it suspended its hospital operations there on Thursday morning. People are sleeping in the open without mosquito nets to protect against malaria and he said there have been reports of cholera in the area in recent months. Government forces are in control of nearby Kodok town after fighting ended there on Wednesday, Sudan People’s Liberation Army (SPLA) deputy spokesman Colonel Santo Domic Chol said. “The SPLA is calling on their citizens to come back to their houses,” he told the Thomson Reuters Foundation via phone, declining to give casualty figures.